The 325A was available with a hand-cranked carriage. and was the company’s first power carriage model. It has automatic grippers only, no pedal (like the No. 3), which requires the operator to roll the carriage forward to raise the grippers, then roll carriage back to meet the paper. 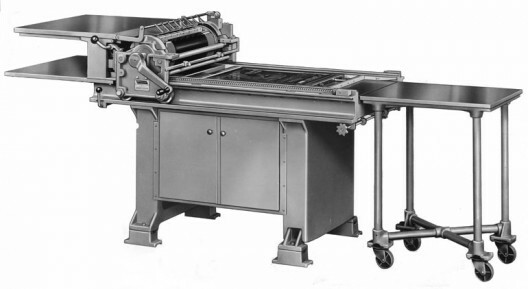 The 325A also features an adjustable bed end to help move large forms between the press and a truck (a rolling iron table). Optional automatic sheet delivery and ink fountain were originally available. Maximum form: 24 × 24½”; maximum sheet: 25 × 30″. There are fewer than ten 325A presses in the Vandercook census. See 320G, 325G.